At first glance, this looks like a, let's say, "homage" to Gears of War. You have a beefy protagonist who shrugs off injuries by crouching behind a wall and catching his breath, and cover-based shooting gameplay. 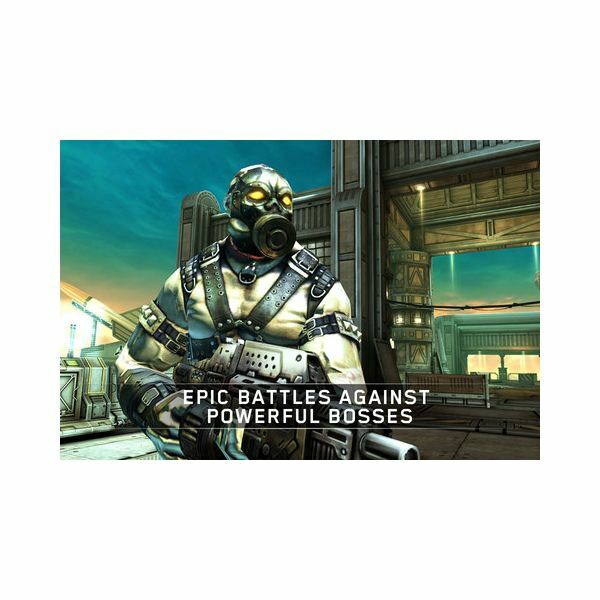 Lots of games have that, and Gears of War is the best example of that genre. 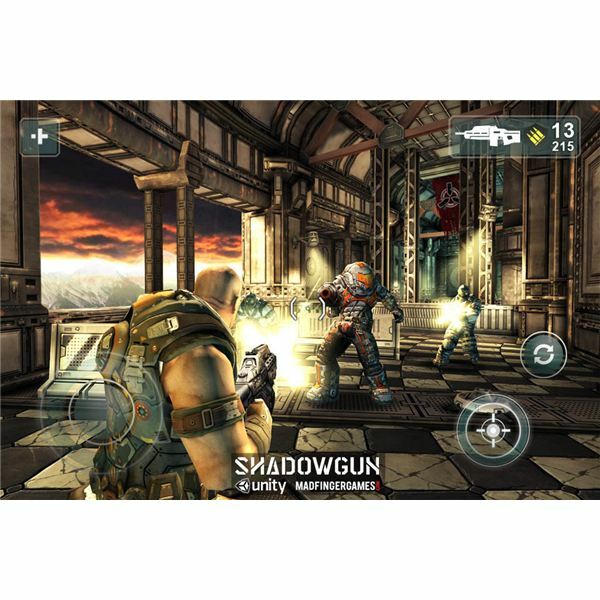 You can't help but compare the gameplay to Gears, but Shadowgun stands on its own as a great game. In the year 2350, corporations have taken the place of governments. Our protagonist Bruce Willis John Slade is a "Shadowgun," a mercenary hired by the Toltech Corporation to retrieve Dr. Edgar Simon, a disgruntled ex-employee. The trick is that Dr. Simon is also an evil genius and talented geneticist with an army of mutant cyborgs and robots. Bruce John will have to fight his way through Dr. Simon's heavily fortified facility, aided by his android co-pilot, S.A.R.A. 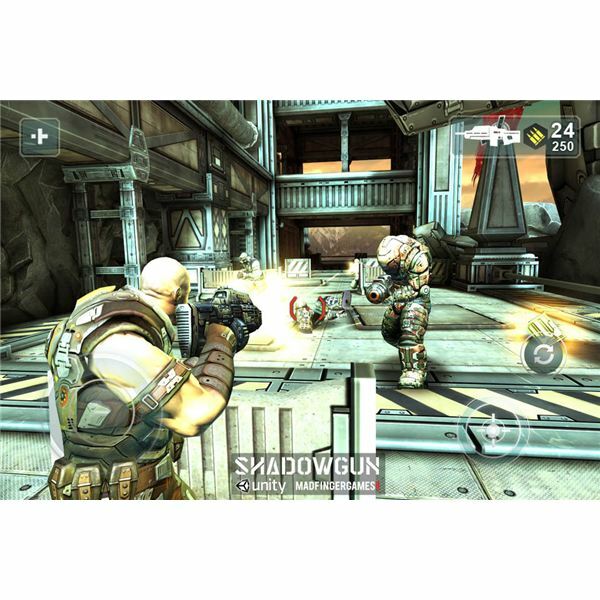 I reviewed this game on an iPhone 3GS. 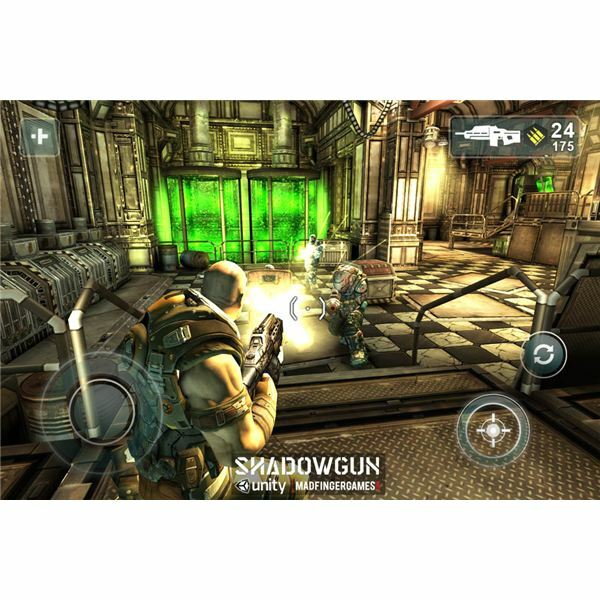 The game scales its graphics upwards on newer iOS devices according to the publisher, although it looked and handled great on my phone. The controls are pretty responsive. 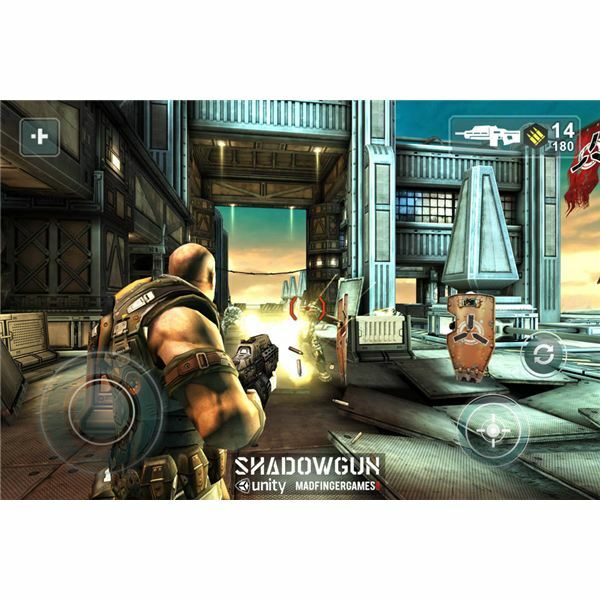 The left half of your screen controls your movement while the right controls aiming. there are buttons on the right side of the screen to switch weapons, fire and reload your gun, The left half has the pause menu in the corner. During combat, you can walk up to the edge of a wall or behind a barrier to automatically hide behind it. John is very vulnerable to sustained fire, so it's best to hide behind things while returning fire from the robots and cyborgs Dr. Simon throws at you. The weapons are all pretty standard, serviceable stuff, like a submachine gun, shotgun, and grenade launcher. You can also leap forward over obstacles to charge into the enemy or run to the next bit of cover. There's no dash button, so every little bit of distance you can shave off counts. The action is broken up by finding and/or shooting switches, finding weapons, and a Simon-like lockpicking game for some doors. The game has no map, but the areas aren't terribly huge so you can figure out where you need to go pretty easily. You can tell when you're going to have to hunker down and fight off some baddies whenever you see things to hide behind. Overall it's not too hard, unless you crank the combat difficulty up all the way when starting a new game. Overall, the game is very responsive given the controls. 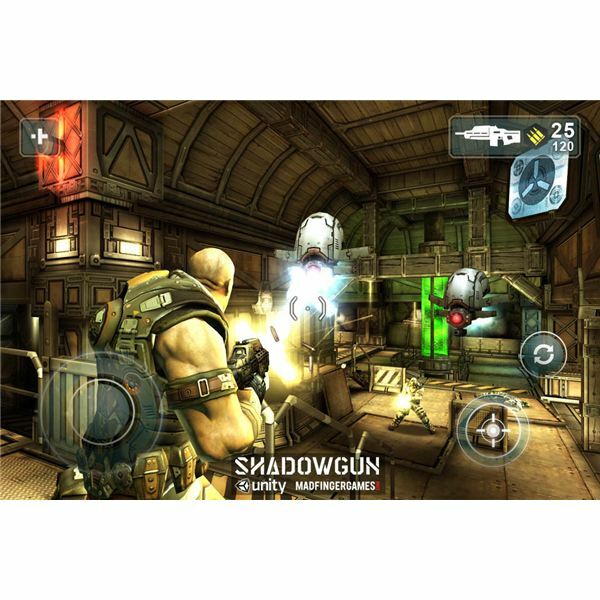 If you're used to Gears of War or an Xbox 360 controller, you may feel a little limited in your tactical and movement choices. 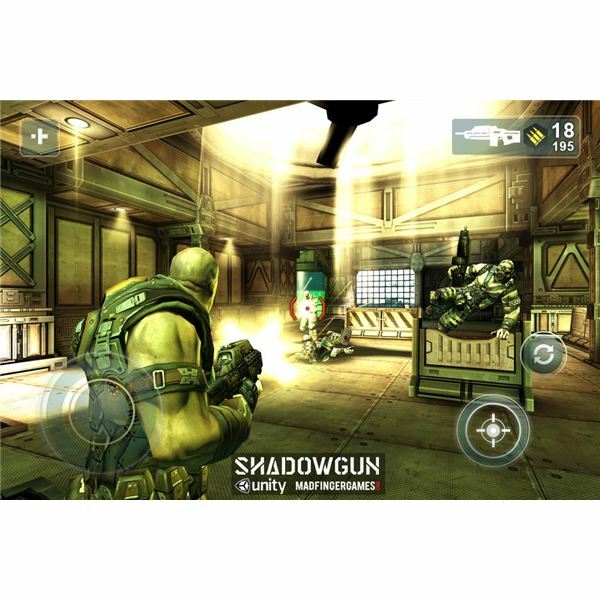 On the other hand, this is one of the best third-person shooters on iOS to date, so the medium is still evolving. This game looks as good as a current or last generation console game. It's that pretty and smooth, with great lighting effects and no slowdown, even on an older iPhone 3GS. I didn't see any jaggies, so there's some good anti-aliasing in effect. Plus, John looks very much like Bruce Willis, which can be a definite plus for many action fans. The lip syncing is not the best, but you're not really looking at any of the character's faces often, so it's not that big of a deal. The game's sounds are pretty generic, if a bit quiet. Nothing really stands out, though nothing is actually bad outside of the bland industrial music that starts pumping when the enemies flood into the combat area. It's the kind of music that makes people complain about not liking rock music or metal (even though it's neither of those.) It can't be turned off without muting the whole game, so I guess it's a good thing it's so bland. Nothing’s Perfect. What Are The Flaws? 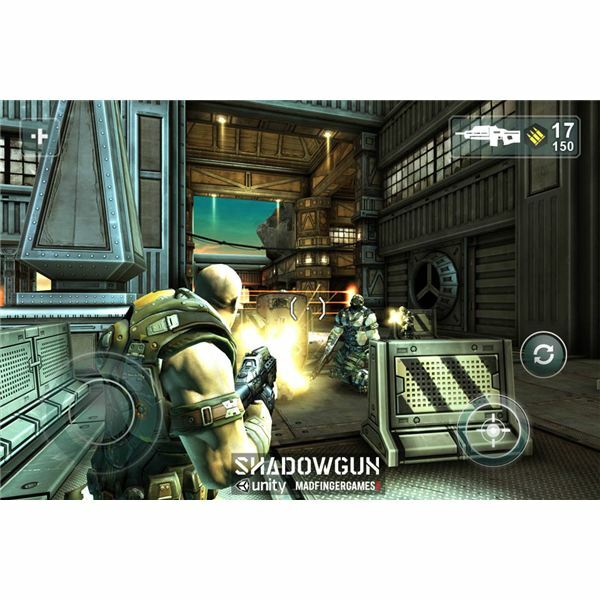 Even though Shadowgun is a great game, there are a couple of small problems with it. The most obvious one is that it's a battery hog. I only got a couple of hours of game time on a full charge before my phone informed me it was going to shut down shortly. To be fair, I may have lost track of time and my phone is a couple of years old so it may not have the lasting power of, say, an iPad 2 or iPhone 4S. The other major problem I found was that coming from Gears of War and Deus Ex: Human Revolution I was expecting more from the cover aspect. The only way to get out of cover is to back away from the wall or cover while facing it or climbing over it, so if you've chosen your cover poorly you may die before you can compensate. There's also no melee button, so you really need to make sure to kill those little robo-snails before they overwhelm you. Another problem was that my thumbs covered a fair bit of the screen while playing. This is a problem when touch-screen games try to give the level of control found in a console controller. It's probably less of an issue on an iPad. Is This Game Worth a Buy? Overall, this game is a great example of the potential for touch-screen gaming. It's a "real" game that would not be out of place on modern consoles as a downloadable game. It's a good solid 6 hours or so of gameplay, though your battery might not last that long. You'll get to the robot lobster for sure though. Yes, there is a robot lobster to battle. 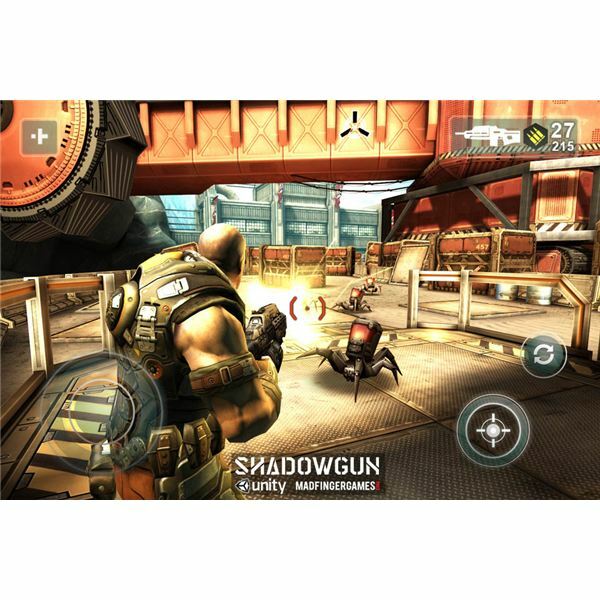 Shadowgun is available on the iTunes store for $7.99 USD.